I have read several sites/articles/books in the past which state that fingers that have an extra crease tend to be on the longer side/measure long. In another discussion on the forum about extra creases on the fingers, it was the non-dominate hand which had the (majority) extra creases found. I found this surprising because I thought that the non-dominate hand was usually slightly smaller than the dominate hand, so I would have expected the “longer fingers” to be on the dominate hand (which I guess they might be or the palm could be longer). Patti explained so well about the development of the bones in the fingers and how “When the digits form, the distal interphalangeal joint forms before the middle interphalangeal joint forms. For a short time there is a long soft pre-bone tissue or cartilage between the metacarpophalangeal and the distal interphalangeal joint. This would not indicate that a finger finger found with extra creases is not necessarily longer. Anyone have observations on this? Re: Do extra creases on the finger(s) indicate long fingers? 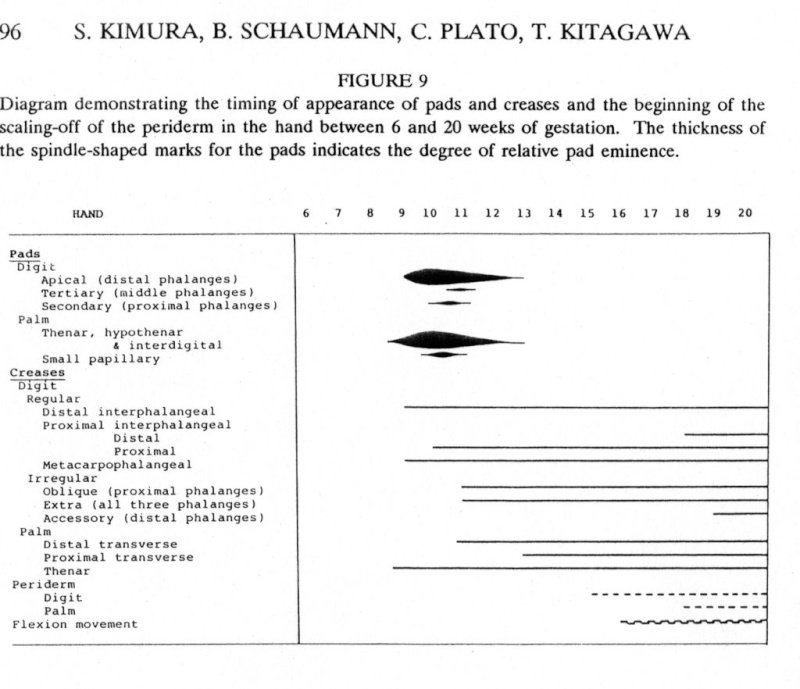 Some pages are missing from public view but if you study this chart you can see the extra creases appear about the same time as the middle phalange appears. This would be flesh or tissue. Bone development is another study and later than the outer flesh. Up until near this century it was thought that the fingers could not flex until after the formation of the creases, around 16 weeks (shown above), which meant flexion was not the cause of the creases. More recent research shows the fingers can flex much earlier than previously thought at 10 to 12 weeks. This means that flexion most likely is playing a big role in the development of the flexion creases. End of page 471 and beginning of 472 gives a list of earliest fetal movements. Here they say the earliest movement is the tilting of the head at 7.5 weeks. Twitching movement before 10 weeks followed by actual limb movement after 10 weeks. Hand to face movement is at 12 to 13 weeks. I might need to add a few more books to my collection.